Fol­low­ing my Cap­tain Atom Vol. 1 Sav­age Hawk­man Vol. 1 write-up, Sta­t­ic Shock Vol. 1 is up on the read list. Sta­t­ic may be the only super­hero with a cos­tume that is at some times skin-tight and oth­er times bag­gy. 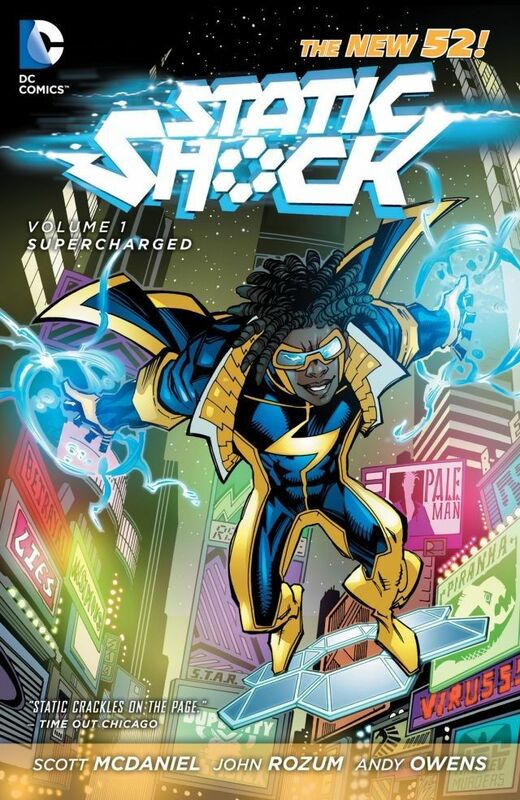 This book right in the mid­dle of things with Sta­t­ic Shock relo­cat­ed to New York City with his fam­i­ly as he interns at STAR Labs as he tries to fig­ure out what hap­pened to his per­fect­ly cloned sis­ter. A mul­ti­tude of bad guys are intro­duced, in an elab­o­rate ver­ti­cal monopoly of evil from street lev­el gang­sters to super-pow­ered enforcers for a shad­owy gov­ern­ment con­spir­a­cy. Quan­tum Juice, the sub­stance that gave Sta­t­ic his pow­ers, is pur­chased by the bad guy and test­ed on unwill­ing sub­jects. Infight­ing makes the con­spir­a­cy fall apart, and Sta­t­ic takes down the sur­prise ring­lead­er with the help of his super­hero men­tor and his own clone, who dis­guised him­self as Alka­li to infil­trate the bad­dies. After the big show­down, his fam­i­ly decides to stay in New York and he con­tin­ues to fight crime even though his “twin” sis­ters have accept­ed each oth­er. Unfor­tu­nate­ly, Sta­t­ic Shock was can­celed after the­se eight issues, so I am not expect­ing much in the way of future res­o­lu­tion. This book intro­duces Vir­gil Hawkins (Sta­t­ic Shock), Sunspot, Slate Gang, Trey Uhu­ru, Nico Patrol­lus, Jann Jon, Cole Brick, Kim Dagar, Dr. Cur­tis Met­calf (Hard­ware), Joey Scroc­cone (Piran­ha), Pale Man, Charles White, Kaitlin Stone, Emil­io Mar­co, Tan Yeung, Vir­ule, Jean Hawkins, Sharon Hawkins (and her clone), Robert Hawkins, Frieda Goren, Quentin, Dyson, Car­los, Nathan Flack (Dr. Nemo), Nec­ahual “Nec­ca” Mar­tinez (Guil­loti­na), Dr. David David­son, Alka­lie, 30 Weight, Biz Mon­ey B, Lar­ry Wade, Tiffany Evans (Tech­nique), Dr. Lewis, Vanes­sa, and Phayze. Hawk­man, Cap­tain Atom, Gar­rison Slate, Dark­star, Kar­mon Stringer (Rub­ber­band Man), Gior­dano Fam­i­ly, and K’llumnus are men­tioned. Pan­do­ra gets her cameo out­side the Hawkins fam­i­ly res­i­dence as Vir­gil is ask­ing his dad about get­ting a driver’s license. Besides his intern­ship at STAR Labs, Hard­ware set up a secret base for Sta­t­ic at Wright Tools. The Man­hat­tan vol­cano from Cap­tain Atom Vol. 1 appears. Next up, Sav­age Hawk­man Vol. 1 Super­girl Vol. 1.